Born Feb 3 1938, died June 11, 2016. Barbara was born in Woodbury, NJ, the daughter of Baxter A. Livengood and Jessie Crain Livengood. 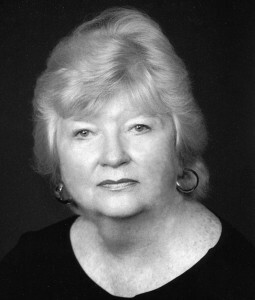 She graduated from The Baldwin School and went on to earn a Bachelor of Arts degree from Vassar College, Class of 1960. She studied 19th Century British art, literature and history at the University of London and participated in a graduate-level program on urban civil rights and social change at the University of Pennsylvania. Her interest in civil rights and social issues became a lifelong passion, expressed through numerous community organizations and political associations. Following college she worked as an editor of medical research papers for Lankenau Hospital and of engineering materials for Drexel Dynamics. As Young Adult Librarian at the Free Library of Philadelphia, she reviewed books for the library’s collection; the focus and joy of her work was stimulating students to become lifelong readers. She was also a freelance writer and prolific poet. In 1969 she opened Barbara Russell Designs, a retail needlepoint store that became a fixture of the Chestnut Hill section of Philadelphia for 35 years and evolved into an internationally known wholesale supplier of unique and preeminent needlework designs. From 1990-93 she established the only luxury needlepoint shop in a hotel lobby, at Philadelphia’s Rittenhouse Hotel. She was known as “The Dog Lady of Needlepoint” due to her over 140 various dog designs. Over the years dog show judges and owners would give Barbara pictures to use as the basis for designs of their favorite breed. Many other unusual animals, botanical themes and historical mosaics were subjects of Barbara’s designs. In addition to the retail and wholesale businesses, she taught needlepoint classes and evangelized the joy, skill and creativity of needlework. Known for her good-natured vitality, she enjoyed cultivating diverse friendships and took to heart advice she received from the president of Vassar College: to teach oneself throughout a lifetime. She believed that obstacles in her path were not blockages preventing progress; rather they were teachers and guides towards progress in life. Experiencing loving relationships was what she considered her life’s greatest success. In addition to her community work she volunteered as an usher at Church of St. Martin-of-the-Fields. Barbara is survived by her children, Holley Elizabeth Russell and David Alexander Russell, and former spouse and the children’s father, James A. Russell. For many years she was a devotee of rare Dandie Dinmont terriers, owning several and using them as needlepoint design subjects. A celebration of Barbara’s life will be held 1 pm, Saturday, June 18, at Church of St. Martin-in-the-Fields, 8000 St. Martins Lane, Philadelphia. In lieu of flowers, donations may be made to the Southern Poverty Law Center, 400 Washington Ave, Montgomery, AL.